The Best Virtual Assistant blogs from thousands of top Virtual Assistant blogs in our index using search and social metrics. Data will be refreshed once a week. 2.37 The Virtual Hub | Outsourcing. Simplified! 2.58 AVA Virtual Assistance | Specializing in Solutions! Virtual Assistant newsletter is a comprehensive summary of the day's most important blog posts and news articles from the best Virtual Assistant websites on the web, and delivered to your email inbox each morning. To subscribe, simply provide us with your email address. Vancouver, Canada About Blog The Market Leader in the Virtual Assistant industry providing FREE resources and training to start up and run a successful Virtual Assistant business. Facebook fans 11,050. Twitter followers 27,620. Sarasota, FL About Blog Many businesses just don’t have the time or expertise to effectively maintain all of their own marketing or bookkeeping processes, so they use Your Virtual Assistant instead. Facebook fans n/a. Twitter followers 52,818. Brighton & Hove, UK About Blog The VA Handbook is for people who want to set up a Virtual Assistant business, work better once they're up and running and for established VA's to learn more skills so they can expand their skill set and even change their niche. Facebook fans 1,520. Twitter followers 3,266. UK About Blog News from the UK Virtual Assistant Industry authored by Justine Curtis. Justine Curtis have been running a virtual assistant practice (My Virtual Assistant) since 2003 when the idea was fairly new in the UK. Facebook fans n/a. Twitter followers 5,281. USA About Blog Virtual Assistant Blog geared for your business. Learn how to increase productivity, efficiency, and increase your market share using a Virtual Assistant. Facebook fans 1,085. Twitter followers 15,674. About Blog Find or become a kickass virtual assistant today! New Delhi, India About Blog The latest news, videos, and discussion topics on Virtual Assistant. Facebook fans 3,353. Twitter followers 15,310. Bangalore, India About Blog GetFriday is the leading virtual assistant service provider offering personal assistance and business process support to busy individuals, entrepreneurs, SMEs. Facebook fans 695. Twitter followers 753. About Blog The Contemporary VA Team: Virtual Assistants at their best! This account is manned by all of us. Facebook fans 1,158. Twitter followers 5,687. San Francisco, CA About Blog Outsourcing to virtual assistants is hardly a new topic, but strategies, tips, and tools are constantly changing. Here, we discuss how to hire, work with, and grow your business with virtual assistants. Facebook fans 1,174,687. Twitter followers 533,727. Sacramento, CA About Blog Real Estate Virtual Assistants improve your team productivity, reduce costs and boost revenues. Spend your time on commission-generating activities. Facebook fans 33,592. Twitter followers 2,942. Palm Beach, Florida About Blog Jennie Lyon Virtual Assistant Services specializes social media, copywriting, marketing, graphic & web design, technical & administrative services. Facebook fans 299. Twitter followers 3,649. Online About Blog Hi I'm Michelle, an entrepreneur specialising in virtual assistance, a digital and real world nomad, and a down-to-earth mother of three. Facebook fans 14,362. Twitter followers 38,603. Lancaster, PA, USA About Blog I have a thriving virtual assistant business and decided that it's time to share my knowledge with others. I started this business so that I could stay at home to raise my son while making a good living. I'll share with you how I did this so that you can have the lifestyle that you really want! Facebook fans 820. Twitter followers 1,463. About Blog Worldwide101 is a premium virtual assistant company for demanding founders and executives. We blog about how to move your business forward. Facebook fans 1,182. Twitter followers 2,433. Huntington Beach, CA About Blog Hire one of our virtual assistant blog experts to manage and get your websites up and going. Facebook fans 2,387. Twitter followers 311. About Blog Want to learn how to start a Virtual Assistant business? At The Virtual Savvy, we help savvy starters grow their VA business to 5k months and beyond! Facebook fans 4,104. Twitter followers 1,023. Worldwide About Blog Delegate tasks to a virtual assistant to grow your business. Facebook fans 108. Twitter followers 1,575. United States About Blog Dream Team Virtual Assistant LLC of Wilmington North Carolina, was established in the year 2006 by owner Roslyn Ellerbee, who started her career in sales/tech support for Apple and then moved over to virtual business support after realizing that she is a peoples' person and can become a great asset to any business with all her knowledge of business startup, marketing, and social media expertise. Facebook fans 137. Twitter followers 1,307. About Blog How to be a Virtual Assistant. How to grow your virtual business. Developing skills for Virtual Assistants in the UK. Sidney, Ohio About Blog Because despite my rocky detours, I’ve created everything I ever wanted—a virtual business that can plug into any port, a multiple six-figure income with room to keep rising, and the chance to help women in every country transform their lives. Facebook fans 10,885. Twitter followers 3,984. Canada, United States About Blog Visit the Canadian Virtual Gurus blog for the latest virtual assistant news, announcements, tips, and tales from behind the desk! Facebook fans 2,013. Twitter followers 2,720. India About Blog A gateway for task delegation, remote assistance and better workload management. Wishup pioneers in providing virtual assistant or remote assistant services. Professional Assistants Customer Support Available. Facebook fans 5,385. Twitter followers 261. UK About Blog Become an “Awesome and Authentic VA” with the blog of VACT Limited. Dedicated to helping aspiring and new Virtual Assistants to launch, create and grow their own successful VA business, and established VAs to build, and grow an awesome and authentic VA business. Facebook fans 2,740. Twitter followers 5,614. About Blog For the best blogs about Virtual Assistants be sure to read our weekly blogs on Virtual Assistants Association of South Africa. Facebook fans 154. Twitter followers n/a. CA About Blog We provide busy people with the right, pre-screened virtual assistant for their needs. The assistants work offsite and only as many hours as needed. It's a flexible and cost effective way to get just about any sort of business support. Facebook fans 311. Twitter followers 608. Fremont, CA About Blog VirtualAssistantTalent.Com is dedicated to helping Small Business Owners, Real Estate Investors, Real Estate Agents, Physicians, etc. to grow, expand, and make their businesses more efficient/cost effective by outsourcing to the Philippines with our skilled, & reliable Filipino virtual assistants. Facebook fans 3,196. Twitter followers 1,778. About Blog Industry leading eLuminousVA Online Virtual Assistant Services allows you to acquire experienced and talented virtual executive assistant to make your life easier. Facebook fans 105. Twitter followers 68. Pittsburgh, USA About Blog Make Your Business Run Smoothly With A Virtual Assistant. Facebook fans 10,944. Twitter followers 9. UK About Blog Raising awareness, promoting best practice and supporting the UK Virtual Assistant industry. The Society of Virtual Assistants was formed in 2005. Facebook fans n/a. Twitter followers 2,386. London, England About Blog We intend to feedback and share the knowledge we have learnt from our highly effective Executives & Fyxer's. Facebook fans 496. Twitter followers 2,360. Philippines About Blog Pepper Virtual Assistants is a Philippine-based virtual assistance company catering to businesses and companies all over the world. Our dynamic and competent team is a mix of experienced and young VAs specializing in executive assistance, marketing support, and digital project management. Facebook fans 1,360. Twitter followers 1,218. Canandaigua, NY, United States About Blog We are a team of virtual assistants and web developers that specialize in supporting great heart-centered life coaches and entrepreneurs – allowing them to focus on doing what they love most, while saving valuable time and money. Facebook fans 447. Twitter followers 8. United States About Blog Elite Virtual Assistants helps small business owners get more more done in less time. Facebook fans 303. Twitter followers 7,403. 500East 4th St,Austin TX 78701 About Blog Professional virtual assistant services from Ukraine to delegate time consuming tasks and become more efficient. Facebook fans 957. Twitter followers 5,558. About Blog Our Job Is To Make Your Job Easier We take care of the details, so that you can focus on building your growing business. Facebook fans 1,245. Twitter followers n/a. 37. The Virtual Hub | Outsourcing. Simplified! About Blog Our mission is to eradicate small business overwhelm by simplifying the offshore outsourcing process and facilitating cost-effective business scalability. Facebook fans 108. Twitter followers 126. Laguna, Philippines About Blog Let these virtual assistant and outsourcing services blog give you an in-depth understanding of the industry. Facebook fans 2,590. Twitter followers 157. About Blog Madison is a Virtual Assistant and Social Media Manager who helps creative small business dominate social media and accomplish their to-do list! Facebook fans 281. Twitter followers 3,232. WorldWide About Blog Hire your Dedicated Virtual Personal Assistant for manage your all types of General Administrative, Marketing and Business related tasks. Facebook fans 345. Twitter followers 165. QC, Canada About Blog NS Virtual Services provides virtual business services ranging from general admin and customer service, to social media and web development. Facebook fans 373. Twitter followers 856. Israel About Blog The latest news in the outsourcing world is live on our Virtual Assistant Blog. Virtual Assistant Israel is the leading provider of top VAs worldwide. Facebook fans 654. Twitter followers 1,803. Illinois About Blog What makes a great virtual assistant? Take a look at our virtual assistant services and find out. Our mission is simple: remove the administrative burden to make your life a little easier. Our Core Values: Excellence Integrity Partnership. Find out how a virtual assistant can grow your business. Facebook fans 491. Twitter followers 1,472. About Blog Bottleneck Virtual Assistants may have a new name, but we have been working with VA's since 2007. We help entrepreneurs and small businesses find good VA's. About Blog DPinoy For Hire is the ultimate solution for all your outsourcing needs. Dedicated Full Time and Part Time Virtual Assistants Service. Facebook fans 1,075. Twitter followers 8. About Blog Tips, tricks, and hacks for VAs and the people who love them. Facebook fans n/a. Twitter followers 4,021. South Africa About Blog AdminAssist provides professional assistants who work per hour and help people from everywhere in the world get the most out of their lives. Facebook fans 763. Twitter followers 153. About Blog I offer virtual assistant and digital design services to savvy business women who want to boost productivity without the stress. Facebook fans 89. Twitter followers n/a. About Blog The Happy Work-At-Home Mom is the happy journey of a homeschooling mom, wife, friend, entrepreneur, and one cool virtual assistant. It includes entrepreneurship, virtual assistance and crafting ramblings of a happy work-at-home mom. Facebook fans 1,809. Twitter followers 303. Victoria, BC About Blog Digital marketing and technology assistance, support, and training for entrepreneurs. Scared of technology? Let us help! Facebook fans 378. Twitter followers 899. About Blog Your UK based virtual resource services Check out the Purple Haze blog for more information on how getting your own virtual assistant can make your life easier and your business more profitable! Facebook fans 230. Twitter followers 6,397. About Blog For information on virtual assistants and virtual business solutions for entrepreneurs, business owners and soloprenuers, check out the Freedom Makers’ Blog. Facebook fans 555. Twitter followers n/a. Alpharetta, GA About Blog My BTLR provides the best virtual assistants in the industry. From executive support to bookkeeping, we can help you complete your tasks list. Facebook fans 22. Twitter followers 45. Sydney About Blog A professional Virtual Assistant team based in South West Sydney supporting SMEs with their outsourcing requirements. Facebook fans 767. Twitter followers 352. Cagayan de Oro , Philippines About Blog A Filipino VA blog where learning and sharing of tools, programs and websites on How to be an Effective Virtual Assistant (VA) takes place. Facebook fans n/a. Twitter followers 152. About Blog We provide personalised and customised virtual assistance. Our Virtual Assistants are experienced, reliable, and vetted and waiting to help your business. Facebook fans 371. Twitter followers n/a. Toodyay, Western Australia About Blog After writing for clients as a virtual assistant for years and receiving so much positive feedback I released I was damn good at this thing! Now I write regularly for women in small business in a variety of industries including business coaching, personal branding, finance, consulting and marketing. Facebook fans 16,778. Twitter followers 111. 58. AVA Virtual Assistance | Specializing in Solutions! Southern Oregon About Blog The blog for business owners and office administrators. By Virtual Assistants who, like all others, have special interest and personality in what they do. Facebook fans 213. Twitter followers 983. About Blog Hello, I'm Bridget, founder of Your Virtual Assistant Co! After years of sleepless nights and a never ending to-do list, running both my bridal boutique and wedding design businesses, I knew I needed help! Facebook fans 84. Twitter followers n/a. Facebook fans 44. Twitter followers 52. Digos City, Philippines About Blog Virtual F1 is a Philippine-based institution, particularly Digos City, and a work-friendly environment where hardworking and compassionate craftsmen work and where honesty, humility, integrity, respect, and commitment collaboratively reside. Facebook fans 854. Twitter followers 231. Charlotte, NC About Blog Hi - I'm Jay! Virtual Assistant Coach Relationship Marketing Expert. I help women gain confidence, increase their income, and experience freedom by becoming successful virtual assistants. Facebook fans 182. Twitter followers 589. Hemel Hempstead About Blog Self-employed Freelance Virtual Assistant. By hiring a freelance VA on either an ad-hoc or cost-saving monthly retainer basis, you get the help and support you need but without the costs of hiring an employee! Facebook fans 284. Twitter followers 398. UK About Blog Certified Virtual Assistant providing reliable support services to start-ups, entrepreneurs and business owners. Facebook fans n/a. Twitter followers 385. California About Blog Honest Virtual Assistant Reviews & Ratings by Real Users. 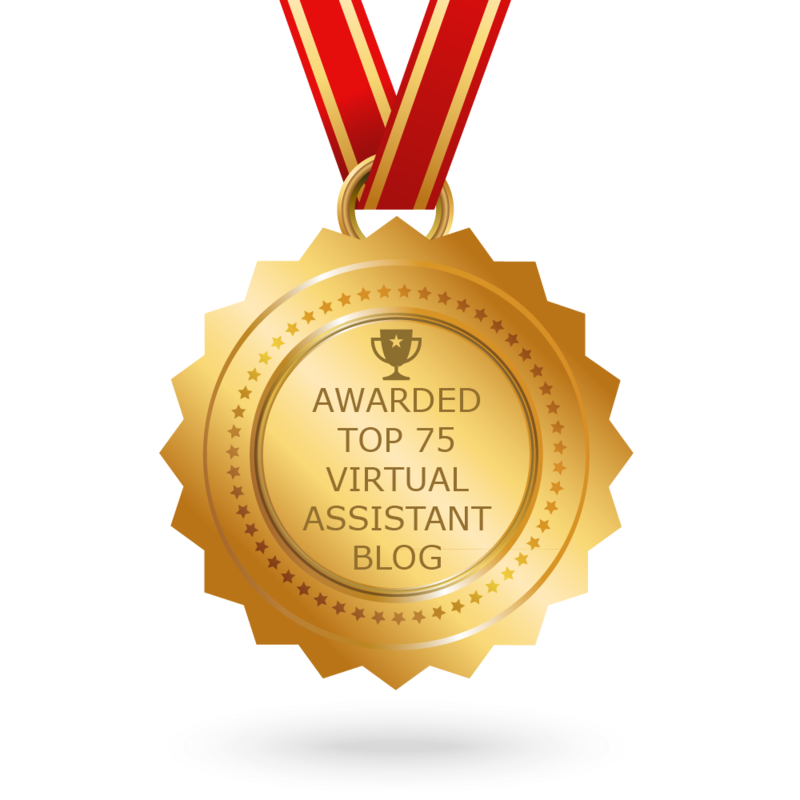 CONGRATULATIONS to every blogger that has made this Top Virtual Assistant Blogs list! This is the most comprehensive list of best Virtual Assistant blogs on the internet and I’m honoured to have you as part of this! I personally give you a high-five and want to thank you for your contribution to this world.